Italian Sterling Silver Hoop Earrings Only $4.99 + FREE Shipping (Reg. $69.95)! You are here: Home / Great Deals / Italian Sterling Silver Hoop Earrings Only $4.99 + FREE Shipping (Reg. $69.95)! 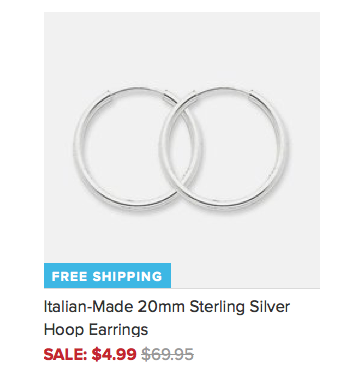 Hurry and snag a pair of these beautiful Italian Sterling Silver Hoop Earrings for only $4.99 + FREE Shipping (reg. $69.95)! These will compliment any outfit, and would even make a lovely gift!